Handheld Imager Market size in 2015 was over USD 1.48 billion, and is set to grow at a CAGR of 12% over the forecast timeline. Advancement in technology such as infrared imaging is projected to drive the handheld imager market size over the next few years. The increasing adoption is also accredited to the rising security concern in areas including government and airports. Moreover, ability to locate, track and capture criminal in adverse conditions may drive the industry demand. 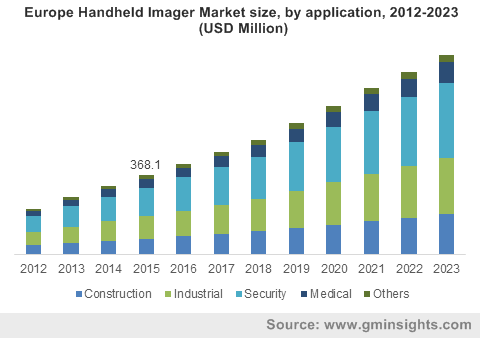 Increasing scope of applications including security, medical and industrial is anticipated to drive the handheld imager market in the coming years. Rising terrorism threat and criminal activity are influencing the growth. The abilities of the imager in sector to diagnose patient’s body, inner ears or the health of the patients’ retinas may escalate the demand across medical space; for instance, Clarius Mobile Health multi-purpose handheld scanner for the abdomen and lungs. The inability to function effectively in case of the presence of water and glass, particularly in case of high temperature may hinder the handheld imager market size. Security applications accounted for over 35% of the handheld imager market share in 2015, and will remain the dominant segment on account of the expanding demand for security solutions and rapid urbanization. Increasing government investments in airports, and stations on a global scale to enhance safety and security is predicted to fuel demand in the coming years. Rising terrorism and criminal activity will prove favorable for revenue growth. The handheld imager market size in the industrial sector was considerable, and is set to witness significant growth as these scanners are reliable and durable in nature. Moreover, Direct Park Marking (DPM) technology enhances barcode reading performances as it allows directly to mark barcode instead of printing on paper label. Medical applications are poised to witness substantial growth over the future owing to rising patient health and safety concern. Increasing focus to diagnose and monitor patients are increasing the adoption. Furthermore, advance features such as aggressive decoding performance and antimicrobial may influence the handheld imager market growth. Stud finders market size is expected to observe substantial growth at over 17% CAGR from 2016 to 2023. Increasing need to implement imaging solutions that are compatible with the other operations are expected to augment the growth. IR scanner market share is expected to dominate the industry over forecast period accredited to the high degree of usage across applications. Features such as error reduction, inventory control and time savings may increase the adoption in coming years. Furthermore, ability to scan and print output printed codes to computer are expected to increase the demand in the construction segment. Millimeter wave scanners may also witness high adoption rate from 2016 to 2023 as they detect concealed objects. North America represented the largest regional industry in 2015, it is projected to grow at CAGR of nearly 12% over the next few years due to increase in criminal activities and security breaches. Stringent government regulations and norms to mandate the usage in airport security are expected to drive the U.S. handheld imager market size. Asia Pacific is anticipated to witness noteworthy growth at over 13% CAGR from 2016 to 2023. High security requirements will enhance the regional demand. Moreover, rising need to synchronize process and operations to reduce cost have also resulted in growth across the India and China handheld imager market. Ability to detect weapons, explosives, and other dangerous objects will also contribute to regional demand. Europe handheld imager market share may observe considerable adoption over the coming years owing to reduce in the manufacturing cost. Moreover, increasing usage of technology such as silicon microbolometer provides benefits including sharp moving objects and minimum power consumption that will boost the regional demand. Key players operating in the handheld imager market comprise Zircon Corporation, FLIR Systems, and ULIS. The industry is highly competitive and players faces intense competition from the new entrants. Manufacturers focus to introduce differentiated products and innovative technique to reduce overall cost. Dominant players focus to develop and build strong presence to sustain growth in the competitive environment. The technology provides features such as document scanning, barcode scanning, age verification, automatic flash, and on-site calibration. Manufacturers occupying handheld imager market share are developing innovative solutions owing to the rising competition. For instance, in 2015, Nintendo introduced outward facing image sensors in handheld category with figure detection and mode determining functions. In addition, it also offers pulse detecting function to detect user pulse rate, which helps fuel the customer satisfaction. The global industry is driven by the improving manufacturing process and advancements in technology. Companies invest enormously in R&D operations for offering innovative products to sustain in the handheld imager market. Companies are focusing on improving and ensuring robust distribution channel and enhanced technical services in order to achieve maximum profits. Declining handheld imager market price trend is anticipated to increase the demand across several industry verticals. Increasing R&D investments have also contributed to low production cost thereby improving manufacturing technique. Product miniaturization to address the growing demand for lightweight portable devices will drive the industry growth over forecast period.